(including use of an X-ACTO knife to cut foam core), glue and iron on webbing and fasteners. Transform your child into a Shooting Star with this unique, no sew costume. Glue felt onto a foam core placard and add ribbon embellishments for color and pizzazz. Wear over a sweatshirt and pants. Trace pattern to foam core, and cut out with X-ACTO knife. 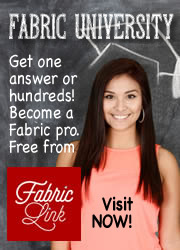 Wrap star with felt and glue the excess fabric to the back, pulling taut as you glue. Iron fusible web to felt and cut out with scissors in a star shape. Remove backing and iron onto the backside of the star. Shoulder straps: Cut 2 pieces of white ribbon, each 17 inches long. From the center of the star at the top, measure out 4 1/2 inches on each side from the center and glue 2 1/2 inches on one end of the ribbon in a vertical position to the back of the star. Iron on 12 inches of VELCRO® Brand Fabric Fusion hook to each end of each strap. Iron on corresponding 12 inches of Fabric Fusion loop tape to shoulder top back of crew sweatshirt on each side. This will secure the star to the sweatshirt while wearing the costume. Cut out pattern in felt. Iron on two pieces of craft stabilizer to the felt, and cut out the pattern. Fold back the excess fabric to the wrong side of the star, and glue the edges of the felt in place on the wrong side of the star hat, pulling the fabric tight to cover the star hat. Cut 4 pieces of 16 inch ribbon alternating colors and space apart about 1 inch on the star hat's right side at the back of the star hat, and glue down. Iron, craft bond stabilizer to a second pattern piece of felt, cut the exact size of the star hat. Iron on this triangle shaped felt backing to the front felt piece. Hat Band: Cut a 25-inch x 6-inch piece of felt and fold in thirds lengthwise. 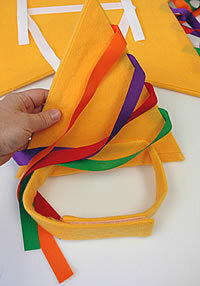 Glue each length together to create a 25-inch x 2-inch headband. Finish with an 8-inch strip of VELCRO® Brand Fabric Fusion, ironing the loop part to one end and hook part to the other end. Find the center of the bottom of the star hat and center the headband on it, gluing down the center 4 1/2 inch of the headband to the hat.